The Bank of Nova Scotia (French: Banque de la Nouvelle-Écosse), operating as Scotiabank (French: Banque Scotia), is a Canadian multinational bank. It is the third largest bank in Canada by deposits and market capitalization. It serves more than 23 million customers in over 55 countries around the world and offers a range of products and services including personal and commercial banking, wealth management, corporate and investment banking. 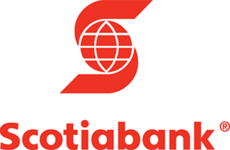 With assets of $896.487 billion, Scotiabank shares trade on the Toronto and New York Stock Exchanges.The bank was founded in Halifax, Nova Scotia in 1832, and moved its executive offices to Toronto, Ontario, in 1900. Scotiabank has billed itself as "Canada's most international bank" due to its acquisitions primarily in Latin America and the Caribbean, and also in Europe and India. Through its subsidiary ScotiaMocatta, it is a member of the London Bullion Market Association and one of five banks that participates in the London gold fixing.